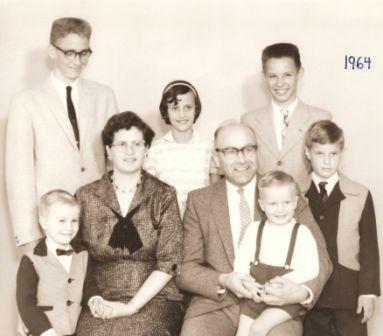 A 1964 photo of John and Corrie with their first six children in Canada, taken in Edmonton. John Moerman - traces family history from 1573 and shares his story from Nazi occupation during WWII to immigration in Canada through 1994. Corrie Moerman - shares her story from childhood and the war years in the Netherlands through 1998. John's brother, "Oom Andries" tells the story of his his internment in WW2 here. Corrie's brother, "Oom Gerhard," shared some of the stories of our family's adventures during the Nazi occupation years in Holland. Jim transcribed them from a voice tape after their telling in 2009. Enjoy the stories in PDF here. Carol's father, Roger Weurding, is remembered in 2008 by Carol's brother Dean. Genealogy: of Murray Moerman ("Marinus") from 1500-2000AD is available upon request from those in the family tree by clicking here.